Meet the artist at the opening reception, Sunday, May 4, 2 – 4 pm. During her reception, she will offer one of her original paintings as a door prize. I have been producing art for as long as I can remember. Greatly, influence by the art of Bea S. Coleman my maternal grandma. She would allow me to sit with her as she painted teaching me to see colour and texture it trees, water, flowers etc. When I was 4 she would allow me to draw or paint beside her as she worked, always encouraging and teaching. I continued to study art taking commercial art in high school and studying at the Three Schools of Art in Toronto as well as many workshops and classes from international artists Jane E. Jones, Margret Martin, James Kerr, etc. I have travelled extensively across Canada from Hollyrod, NF. to Tofino,BC many times over the past years. I strive to recreate the rhythm, harmony, patterns, texture, movement and colour of my surroundings. Constructing a piece that is both pleasing to the eye and yet very intimate to me and hopefully to viewers of my work. When others view my work I want them to be caught up in the flashes of colour, movement, texture, patterns and the life rhythm of each piece. Reflecting on a moment in their lives when they too got caught up in a flash of colour, whisper of the wind, the tactile differences in the world around them. Acrylic, encaustic and mixed media artist, Robbin Pulver-Andrews will be presenting her exhibit entitled, “Moments in Time” until March 31. Robbin was born in Hamilton, Ontario but spent most of her childhood and youth in Northern Ontario, living and working at her family owned Fishing Lodge on Lake Nipissing. She graduated Sheridan College from the Classical Animation program and did some freelance work before getting married shortly after graduation. As her family quickly grew, raising four children became her main focus. Robbin took a job at a local garden centre / nursery, working in the greenhouses and also as an award winning floral designer. She happily worked in this field for many years. In 2006, a serious spinal injury and subsequent surgery, left her with with some physical limitations that made it impossible to return to this kind of work. After spinal surgery and a lengthy recovery period, with the encouragement and help from her family, in 2008 she began painting again. She has had a great response to her work and has never looked back. Robbin is self taught in acrylics and enjoys this medium immensely. She also began experimenting and working with soft pastels, encaustic and mixed medial, teaching these creative art forms at the Art Gallery of Burlington and at her home studio. Robbin’s paintings can be found in collections in various parts of Canada, Europe, and the United States. Her work has also been showcased at the Art Gallery of Hamilton, the Dingham Gallery, Toronto, the Fieldcote Museum, Ancaster and the Carnegie Gallery in Dundas. In June of 2015 she spent an amazing month in Italy as Artist in Residence at Palazzo Rinaldi, Noepoli Italy. 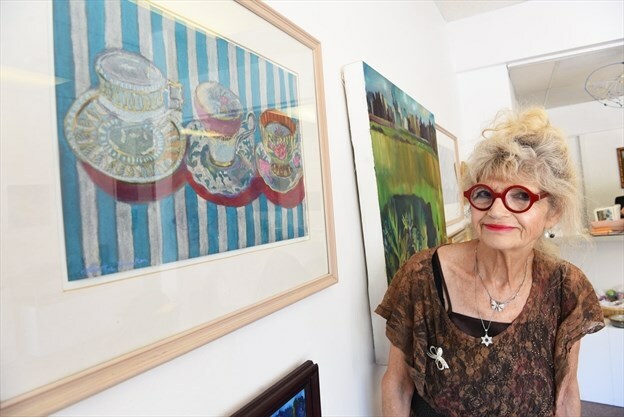 She has won two volunteer awards from the City of Hamilton for her ongoing work in the arts community. Robbin is the Past President of the Women’s Art Association of Hamilton, an organization that has a very long, creative and interesting history in Hamilton. Linda Hankin. This accomplished artist, whose creative artistry is both identifiable and distinguishable, presents eclectic expressions of her travels and life around her home. Having received a Bachelor of Arts degree with Honors in Visual Art, Brock University, St. Catharines, Her residencies, workshops and paintings trips include such destinations as Spain, throughout Newfoundland and the United Kingdom. She has participated in numerous juried and selected solo and group exhibitions, as well as being the recipient of awards and grants throughout her career. Founded in October 1999, The School of Ideas, is her fine art school and contemporary art gallery which exhibits her work and on occasion, the work of invited international artists. The mandate of the gallery is to show work in the area of environmental philosophy, science, the universe, spirituality and mystical associations with the natural world. Studio Tour, August 11 and 12th, 10 am – 5 pm.